I’m really not the right person to be reviewing Fred Vargas’ work, so don’t expect a rating at the end of this post. I read and enjoyed her standalone novel (The Three Evangelists) as a one-off oddity rather than as an example of something I’d willingly read more of and, for me, a little of Commissaire Adamsberg and friends (who appear in her well-known series) goes a very long way. I’ve read one and a half of the books in this series up to now and I wouldn’t have bothered with this one at all if it weren’t for the fact it is nominated for this year’s International Dagger award. The thing is I can’t (or won’t) wrap my literal, logical mind around the fantasy and paranormal plot elements that Vargas is so enamoured of. 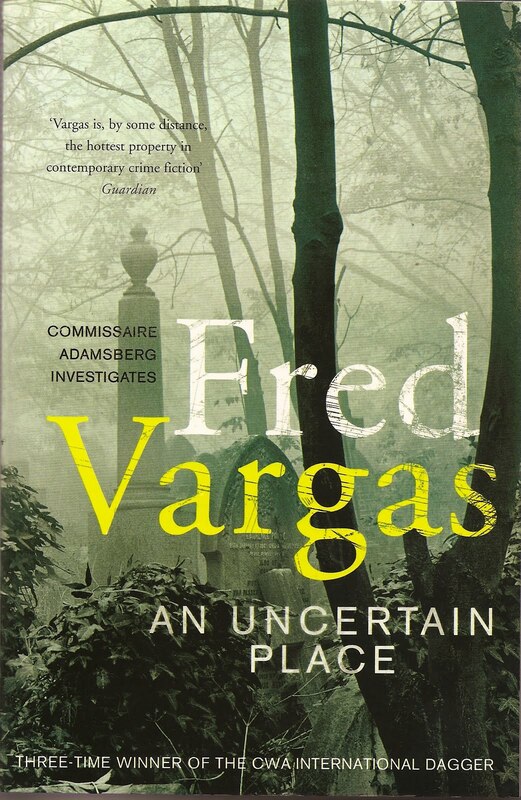 An Uncertain Place is the fifth book (in English translation) to feature the legendary Commissaire Jean-Baptiste Adamsberg of the Serious Crimes Squad in Paris. In this outing he and his Anglophile offsider Danglard are in London for a conference when they happen upon a gruesome scene: nine pairs of boots are discovered outside Highgate cemetery with feet still in them. Ugh. Upon their return to Paris they soon become embroiled in the case of the murder of a retired journalist, whose body has been chopped and smashed into dozens of pieces in his rural home. Via the very opposite of anything approaching actual police work, the case is ‘investigated’ in the usual haphazard way of this crew (whose individual character flaws and neuroses are all well-understood and accounted for by team mates) and, eventually, a connection is made to a family of vampires. Of course I can’t be sure that I haven’t looked for other things not to like about Vargas’ work simply because I’m not a fan of the kind of myths and legends that she incorporates into her work but even if that is the case I can’t help having found other things not to my liking. Reading this was, for me, on par with watching a David Lynch movie or the TV show Lost: the enjoyment is meant to be obtained from the intellectual games that are played along the way and one is, I presume, meant to turn a blind eye to anything ridiculous or impossible and I struggle to do this. I can see the cleverness of the linguistic games and even enjoyed things like the way the news account of the man who ate an aeroplane was woven into every aspect of this story. But these games don’t make up for the fact that even the non-fantasy elements of the story are completely unbelievable. In the end there is a total absence of suspense in a book in which any corner can be gotten out of by inventing something that wasn’t there a second ago and couldn’t possibly occur in the real world. At one point in this story for example Adamsberg gets himself into a real pickle far away from his home town and it read to me as if the author hadn’t given a moment’s thought as to how she would get him out of it (there was never any doubt that she would) so she reverse-engineered a character into the spot to save the day. It never really rang true for me but I think as a reader I was meant to be so mesmerised by the verbal jousting between the players that I wouldn’t question the fact it really couldn’t have happened that way at all. I don’t find Adamsberg or any of his colleagues remotely engaging either: they’re just a mass of quirks and oddities, not real people that you get to know and care about over time. For me there comes a point at which it isn’t amusing (or charming or whatever it is meant to be) that the man supposedly in charge of such an important team is such an obtuse fool he wears two watches that are both inaccurate. It’s just stupid. In the same way that I finally admitted publicly a few years ago that I would never finish The Lord of the Rings despite having started it several times, I’m comfortable with the fact that Vargas’ writing is not for me, regardless of how many award shortlists she appears on in the future. I wish her fans many happy hours of reading ahead, I’ll be reading something (anything) else. This book has been reviewed by two people who loved it and one who didn’t at Crime Scraps, Euro Crime and Petrona. It is one of 7 shortlisted titles for the 2011 CWA International Dagger Award. This entry was posted in book review, Fred Vargas. Bookmark the permalink. I enjoy Vargas’ creativity, her imagination and her quirkiness. I’m willing to go wherever this author takes me. Her mysteries are so clever and unformulaic; in fact, they are anti-formulaic, all to the good in my opinion.. And, I, who does not believe in anything that I can’t see or that has not been scientifically proven, have always seen a logical, materialist explanation for the imaginative and quirky occurrences in her books: the wolf killings, the bubonic plague-caused deaths, the chalk circles, the moved/planted tree, etc., etc. That said, if there’s anything I’ve learned in my reading of mystery blogs and book reviews, it is that reading likes and dislikes come down to a matter of taste, when all is said and done. I so appreciate your honest and in-depth reviews and their content on all books. And I appreciate that readers have different opinions on books, like all things in literature, art, music, and more, especially movies! That causes more thinking — always good. I cannot wait to read this and pass it around to co-reading friends with whom I share books. Their tastes vary greatly, although they all like Jo Nesbo, Stieg Larsson and Sara Paretsky.. Even Donna Leon is not liked by all, which surprises me. But I think An Uncertain Place will face a huge variation of opinions, and analysis, all of which I must hear and will enjoy. Discussion is great in and of itself. I think this author divides readers like no other! I am of your mind on her, Bernadette – though I liked 3 Evangelists it did veer off into oddities as it went on. I’ve read about three or four Adamsberg novels and I have to admit I don’t have a lot of patience for the lack of reality, and the belief you have to suspend. But others love her (eg Kathy) as you say – I put her in the category of marmite and olives (love or hate). I like the marmiite and olives analogy Maxine – might have to steal that one. I like to think I give things a good try before turning my back but I’m definitely done with this author as there’s too much else that I want to read to be wading through things with gritted teeth. Marmite and olives? I like olives but marmite has never graced my palate — and it doesn’t sound too appetizing. But then again anchovies and cavier are controversial, too. . I can’t wait for my co-reading friends to read this book! There will be all types of opinions just like on the blogosphere. I can just hear it now! Bernadette – Thanks for your review. People just simply don’t seem to feel neutral about Vargas. Either they absolutely love her work… or they absolutely don’t. Like you, I like things to be believable. Some authors can weave an element of the supernatural or the paranormal in and it works. Most of the time, though, it doesn’t, at least for me. You’ve brought up some well-taken points here – thanks. The best reviewers are those who are honest and explain what they liked and didn´t like – and why. I have one of her books on my shelf and plan to read it later this year with an open mind. But I have tried to open the book once or twice without getting further so I am not so sure I´ll give her any awards either. It’s one of those books that you have to approach with an open mind. The crime plot does make sense, at least (that is, does not depend on supernatural explanation as one might fear for quite a large chunk), but often advances are made by leaps of imagination rather than logic. This is the kind of thing you either don’t mind or that drives you mad. I think the author has a rather detached academic approach to her plots, they are games like eg Agatha Christie novels, but with a decidedly French idiosyncratic twist. I still prefer them to the out and out mystical genre, eg The Library of Shadows by Birkegaard or M J Rose’s last few. But Adamsberg is so cold to his family (he doesn’t even see them as his family – his baby and mother of), that I find hard to take as I don’t really want to read about someone like that (especially as he’s supposedly the “hero”). I have always found that Vargas’ plots and denouements have logical solutions, that all that seems “supernatural” is explained as based in reality. She is an archaelogist by profession, so I’d think she is based in science and finding rational solutions to crimes. I have found that, but I’ll read this book with an open mind. Whether or not you like the book or others agree with your views, well thought out reviews (as yours always are) are an invaluable aid to other readers. I think there is a typo in the second para with ‘books’ instead of ‘boots’ – but since you read so much the Freudian slip (if it is a slip) is understandable. Also when I try to send a message using the box on the right hand side of your web-page, I am taken to the goodreads page for ‘unplugged’ – seems that the link has over-written the form somehow. Maybe it is my browser (Firefox). Thanks Cliff – definitely a Freudian slip. As for the message box you’re right it does behave oddly in some browsers (not Chrome which is my browser of choice). I don’t have much access to the coding for the blog so have moved the items around in my sidebar – it got rid of the problem in IE when I checked at work today so hopefully fixes all other browsers too. Yes, now that the sidebar has been re-arranged with ‘currently reading’ below ‘contact’ the Firefox problem has disappeared. I’ve never read a Vargas book but this reminds me of that Thursday Next series by Jasper Fforde — no matter how much people tell me I should like it, I just don’t. What Karen describes about the Thursday Next series is exactly how I feel. I can’t even figure out descriptions/reviews of the books’ plots. I feel like I’m in another dimension just doing the reading.